TREATT | Ylang Ylang - So Good They Named it Twice! Ylang Ylang - So Good They Named it Twice! Cananga odorata, better known as ylang ylang, is currently a popular consumer choice, with demand remaining high for this essential oil. With a subtle signature scent, ylang ylang oil has many uses, including growing over the purity of ylang ylang oil. Adulteration is becoming increasingly commonplace in its production and suppliers are now looking to address these problems by implementing new, sustainable measures to ensure its continued purity. ylang plant becomes yellow with a strong perfume 20 days later. Although the plant bears flowers throughout the year, a wet environment encourages further growth, meaning the plant flourishes in the rainy season. Ylang ylang oil is produced by distilling the fresh flower cananga odorata var. genuina, which is collected in a range of fractions, depending on its rate of gravity. To produce 2-2.5kg of ylang ylang oil, manufacturers need about 100kg of flowers. The oil is very fluid, clear and has an unusual fragrance, containing high notes of hyacinth and narcissus. Ylang ylang is well suited to the Madagascan climate and, as such, the country has thriving ylang ylang production. This opens up significant commercial opportunities. Earthoil has been working closely with a group of 16 Madagascan farmers, who maintain a large plantation containing over 20,000 certified organic ylang ylang trees. 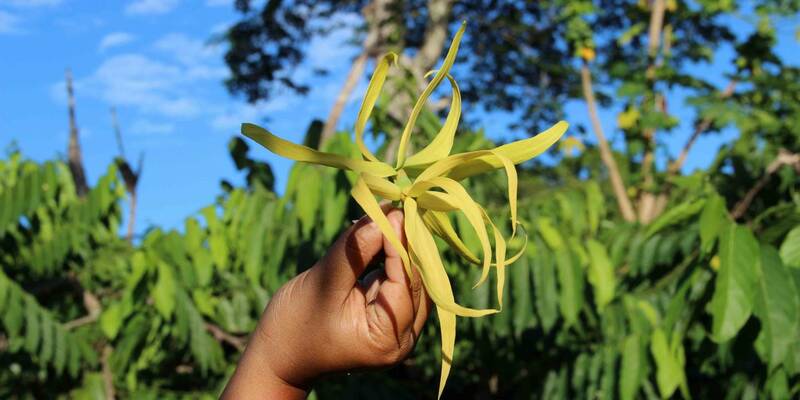 Employing 100 workers from the region, the flowers are handpicked from plantations located on the east coast of Madagascar – this region provides easy access to collect the ylang ylang by boat, as there is still only one road on the island. The flowers are picked before 9am to avoid the intense heat of the sun, and ensure that the flowers don't lose their distinctive aroma volatiles. 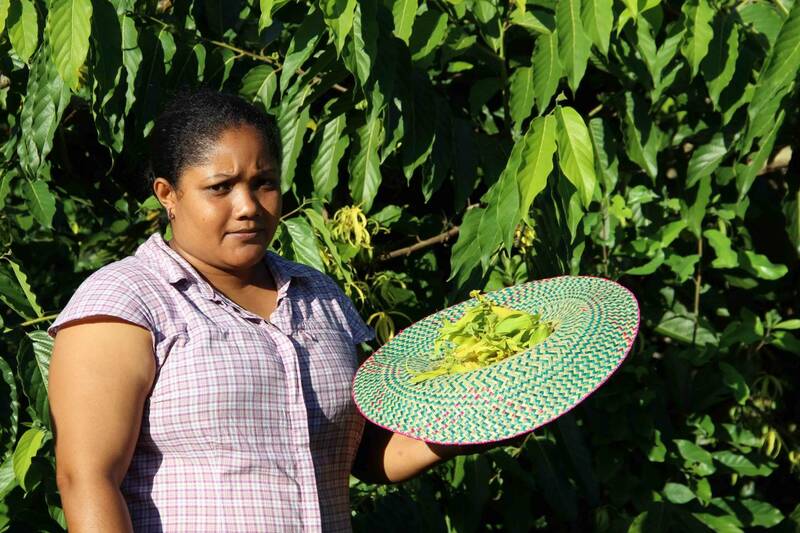 place for these plantations to be certified Fair Trade by the end of 2013 – a move which has been met with approval from the cosmetic industry. After they have been gathered, the ylang ylang flowers are then distilled. In a production process that is steeped in tradition, the flowers are distilled the same morning to ensure the highest quality oil. hasn't changed for almost 30 years. Some other grower groups have modernised their distillation methods. The Comores farmers, for example, now use gas as their energy source instead of wood, further increasing the quality of the grades of oil. Ylang ylang growers only have to pick enough flowers to distil in same the day, which is between 130 and 150kg. A few hours after distillation, the quality of the oil is checked in a bamboo tube. The density is then double-checked before blending according to a grading system which was originally established for perfumers in Grasse. purity of the end product. They also assess the fractions before going to the factory, so that the heat can be amended if necessary. It is worth noting, however, that the quality of the ylang ylang oil differs depending on when it is produced. For example, extra quality oil is only produced in high season from March to May. produced by purely physical means, and be 100 per cent pure and wholly derived from the named botanical source. Fragrance houses are emanding low prices, even when products are highly sought, resulting in unethical practices becoming more prevalent. Lower quality essential oils are now replacing pure or complete oils. The resulting product is of inferior quality and is often used in cheaper perfumes and the soap and cosmetics industries. are now looking to demonstrate their ethical practices and highlight their genuine, fair and ethically sourced ylang ylang oil. The ylang ylang oil produced via Earthoil's farmer groups in Madagascar is pure and 100 per cent natural while also benefitting from a short supply chain. And, as Earthoil is so closely involved with the farmer group and the production of the oil, it is well placed to provide its customers with complete traceability for the oil. This is a key advantage for natural cosmetic companies who only use fully traceable ingredients in their products. Adulteration is a key issue for the ylang ylang industry and its influence is having a negative effect on the quality of the oils entering the global cosmetic and fragrance market. By working closely with farmers such as the growers in Madagascar, companies such as Earthoil can now provide high quality, natural and sustainable ylang ylang ingredients for the global cosmetic market to overcome the negative effect of adulteration. Ylang ylang offers a powerful and distinctive fragrance making it particularly suitable for use in perfumery. Many well known perfumes use ylang ylang thanks to its intense sweet, exotic notes – Chanel number 5 is perhaps the most well known. Ylang ylang is now well established in modern aromatherapy too. The oil is popular among consumers for its calming and relaxing effect on the mind. The sweet and floral aroma can help ease anxiety and is renowned for its soothing properties. Commonly used for its antidepressant benefits, the oil also has aphrodisiac, nervine and sedative properties. against snake and insect bites. oily skin, as well as to stimulate cell growth and reduce the signs of aging.